This website is owned and operated by Joan Aldrich, DBA Junction Creative Studio, a South Carolina company. Our principal place of business is Greenville, SC. You must be at least sixteen years of age to use our website. Use of this website is at your own risk. We host our site on a reputable platform and take reasonable efforts to maintain and host the site. However, we make no explicit representations or warranties as to the safety or your individual use of the website. The terms and conditions contained on this page are subject to change at any time. All images, text, designs, graphics, trademarks and service marks are owned by and property of Joan Aldrich, DBA Junction Creative Studio, or the properly attributed party. It is a violation of federal law to use any of our intellectual property in whole or in part, and modification of any materials contained on this site is illegal and may be prosecuted to the fullest extent permissible should we choose to do so, including asking for financial penalties (damages) and/or an injunction forcing you to stop using our intellectual property immediately. While we may reference certain results, outcomes or situations on this website, you understand and acknowledge that we make no guarantee as to the accuracy of third party statements contained herein or the likelihood of success for you as a result of these statements or any other statements anywhere on this website. If you have medical, legal, or financial questions, you should consult a medical professional, lawyer or CPA and/or CFP respectively. We expressly disclaim any and all responsibility for any actions or omissions you choose to make as a result of using this website, related materials, products, courses or the materials contained herein. This website is updated on a regular basis and while we try to make accurate statements in a timely and effective manner, we cannot guarantee that all materials and related media contained herein are entirely accurate, complete or up to date. You expressly acknowledge and understand that any information or knowledge you gain as a result of using this website is used at your own risk. 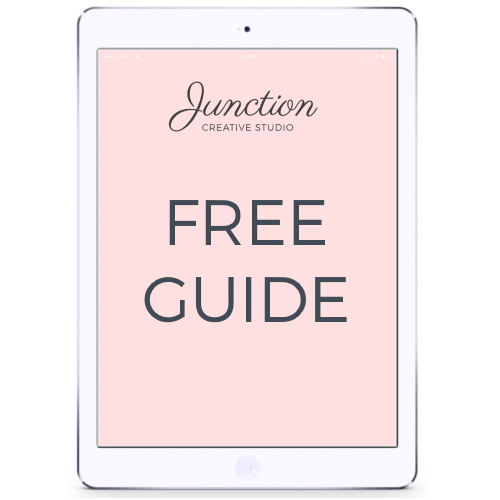 If you should see any errors or omissions and would like to let us know, please email us at joan@junctioncreativestudio.com. Due to the nature of the services and/or products provided, refunds will not be given unless otherwise specified in writing. In the unlikely event that any of our invoices are not paid on time, Junction Creative Studio reserves the right to charge a late fee, as stated on the invoice, or, if no terms are stated, amounting to five percent (5%) of the amount owing for every seven (7) days (or part thereof) that it remains unpaid. After 30 days of outstanding payment, Junction Creative Studio reserves the right to send you to collections, upon which you will owe the total amount of any outstanding payments plus any collection costs including reasonable attorney’s fees. Personal Data: Personal Data is information that can be used to identify you specifically, including your name, billing address, email address, telephone number or demographic information like your age, gender, or hometown. You consent to giving us this information by providing it to us voluntarily on our website or any mobile application. You provide some of this information when you register with or make purchases from our website. You may also provide this information by participating in various activities associated with our site, including commenting on blog posts, contacting us with questions, or participating in group training. Your decision to disclose this data is entirely voluntary. You are under no obligation to provide this information, but your refusal may prevent you from accessing certain benefits from our website or from making purchases. Derivative Data: Derivative data is information that our servers automatically collect about you when you access our website such as your IP address, browser type, the dates and times that you access our website, and the specific pages you view. If you are using a mobile application, our servers may collect information about your device name and type, your phone number, your country of origin, and other interactions with our application. External Links: Our website may include hyperlinks to other websites not controlled by us. We suggest you exercise caution when clicking on a hyperlink. Although we use reasonable care in including a hyperlink on our own website, we do not regularly monitor the websites of these third parties, and are not responsible for any damage or consequences you suffer by using these hyperlinks. We are not bound by the Privacy Policies of any third party website that you access by a hyperlink, nor are they bound by ours. We encourage you to read the Policies of those third party websites before interacting with them or making purchases. They may collect different information and by different methods than we do. Update Account Information: You have the right to update or change any information you have provided to us. To update or delete your information, please contact us at joan@junctioncreativestudio.com. Emails And Communications: You may opt out of receiving future email correspondence from us by checking the appropriate box when you register for the account or make a purchase. You may change your communication settings by contacting us at joan@junctioncreativestudio.com. Marketing Communications: You may opt out of receiving any third party marketing communications or having your personal information used for marketing purposes. You may do this by contacting us at joan@junctioncreativestudio.com.